At thirty-five, Ali is too young to remember the 1979 revolution. Because he was four when the Shah fell, he also misses by a technicality the post-revolutionary baby-boom classification, a description that seems to fit him well. The baby boom came about after Ayatollah Ruhollah Khomeini seized power in Iran and called on the revolutionaries to multiply, to give birth to the future soldiers that would defend the country—and Islam. Many heeded the call. Today, three decades later, about 70 percent of Iran’s 75 million people are under thirty years of age. Shia, but moderate, modern and very well educated, they are a natural antidote to Sunni extremism in the Middle East and Asia—and in that respect, a natural ally to the United States. It was on the force of this generation that the reformist movement came to life. Ali was born into a very religious Shia family in Tehran. His mother and sisters are chador-clad. His father, a “soft hard-liner,” worked for the government. Unlike the Iranians who fled the revolution en masse, Ali’s family stayed back and helped build the Islamic Republic. Ali is tall and gaunt. Even in appearance—often in a white t-shirt and jeans—he shatters the stereotype of the Iranian man that lingered in my mind for many years: He is neither slick and slathered in cologne, nor does he possess the sallow glow of the clergy-in-waiting type that replaced the disco-decade bourgeoisie. Ali grew up in a traditional neighborhood, tucked away in the north of the capital. He did well in school and was the first member of his family to attend college. He won a fiercely competitive spot at Tehran University, and pursued training in what is in Iran the most prestigious field: electrical engineering. He remembers those days at Tehran University, when Akbar Hashemi Rafsanjani was President, as a particularly oppressive time. “It was eerily quiet,” Ali says. “People were dissatisfied, but they didn’t dare speak out. There were no protests. 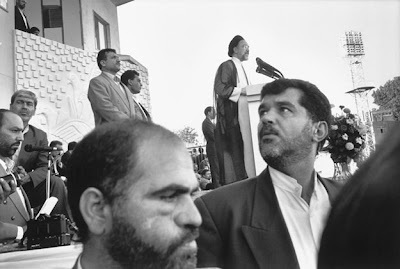 No dissent was tolerated against the government.” The only student upheaval came when Rafsanjani tried to privatize the medical schools, Ali recalls. (Rafsanjani’s nickname was kooseh—shark. That distinction was not meant to reflect Rafsanjani’s predatory nature, but his lack of facial hair. Like a shark, he had only whiskers.) Luckily for Ali and his generation, there was another revolution on the horizon. Even though it was happening far away, it was powerful enough to put a crack in the Rafsanjani armor. One almost typical day at the university in 1994, a classmate waved Ali over to a computer screen. He had been sitting there himself intently for a stretch. “I have something to show you,” he whispered to Ali, with great conspiratorial excitement. H-I, the Iranian boy punched into the keyboard. “Hi,” came the answer, somewhere from America. Ali smiles wryly as he recounts the moment. It was as if his world had just opened up and another universe had come bounding in. Though only a handful of schools in Iran had a computer terminal then, and virtual chats were confined to techies at other universities (browsers were not yet in popular usage), all this would quickly change. Meanwhile, from the inception of this technology in Iran, Ali sat at the foot of its trickling fountain, drinking as if after a long trek through a vast political desert. Upon earning a bachelor’s degree, Ali began his studies anew, this time specializing in information systems. Eager to impart his discoveries, and to put the world at other young Iranian fingertips, he published an article about the Internet and dispersed it among college students. What is the Internet, it was called. Technology is a sign of great advancement among many Iranians. Aghayeh Mohandes—Mr. Engineer—arguably carries more weight than Aghayeh Doctor. Striving to earn that title has filled the country with many engineers (sadly its brightest engineers are also Iran’s greatest export). Iranians are also quite adept at turning disadvantages in their favor. Iran’s isolation in the world and lack of copyright protection, for example, encouraged Iranians to rely on themselves. Textbooks were translated and circulated widely. Source codes were cracked. Software was reverse-engineered, duplicated and sold on the cheap. As the Internet culture boomed in the United States, it did not lag far behind in Iran. And it took hold not only in Tehran, but other far flung provinces of the Islamic Republic, even some remote villages. Most importantly, it provided Iran’s post-Revolutionary generation a vital link to the outside world. And with that link came an avalanche of news sources, “a smacking towering wall of information,” Ali described in Farsi. Ali began to scale that wall a word at a time, dissecting an interesting article or Web site by the paragraph. He plugged new words and unfamiliar concepts into the search engine, which brought forth more unfamiliar words and more new ideas. And as each new word and idea became the basis on which to launch new searches, layers of the outside world began to peel back. In this fashion, scoping the employed passersby, on the hunt for a sympathetic feature that may signal a soul who might hear him out, Ali got his first job at an Iranian television station. He also knew when to hold back. In college he needed to work part-time to support himself. The department head of a prestigious section also ran a government office. “I couldn’t just go up to him during a conference, so I decided to write him a letter,” Ali says. Rather than hand him a letter after a lecture, as a line of other eager students competed for his attention, Ali approached the director’s kindly assistant who took a liking to the industrious young man. “She later called me about an opening they had in one of the government ministries,” he said. Ali worked at the ministry part-time. Upon graduation he turned it into a full-time job. His first project was the ministry’s library, which had only a small collection of books. His job was to expand it and to computerize their acquisition system. To do that, he needed to plug the ministry into the Information Age. “For the first time in the history of the ministry, I put them in contact with foreign publishers. I bought a lot of foreign books, as well as domestic ones,” he said. Ali had an email account since 1994, but he became much more internet proficient while bringing the ministry up to date. Chat rooms, which initially had a lure, were unable to hold his interest for very long. Ali used his time online paging through news sites and researching foreign universities. He wanted, quite literally, to go where his browser went. He had been appointed project manager of an information systems project and had in his new post gained an interest in business management. Business was a widely undeveloped field in Iran and Ali wanted to be equipped with all the most sophisticated tools. So he continued to cast his net further—eventually finding his way to the United States. He was admitted to a prestigious university, where he earned a degree in management. The more he studied business though, the more he felt himself gravitating toward politics. Upon finishing his degree, he started another degree in politics. But even then, he never confined himself to that program. Any chance he got, he crashed courses in other departments. Mohammad is thirty-five years old as well. And like Ali, he was born into a religious family. His even played leading roles in the revolution. “My father wasn’t as religious as his family,” Mohammad says. To separate himself and his family from the more fundamentalist influences that shaped his own life, Mohammad says his father moved his wife, daughter and two sons from a predominantly working class neighborhood in central Tehran, to the north of the city, where Mohammad grew up among more affluent Iranians. In his senior year, Mohammad quit the religious school and enrolled in a regular public school. The next year, he graduated from high school and placed in the top 1 percent of students taking the liberal arts concours, the national university entrance exam named after its French counterpart. “That standing gave Mohammad his choice of top schools, and an opportunity to receive an education in a prestigious field,” his friend Saeed said in a telephone interview from Iran. But Mohammad could not be swayed. He considered politics, but to major in political science meant studying the subject in a vacuum, Mohammad said. Sociology, on the other hand, was dynamic, a field of study drawing from several disciplines, he said. And why go to a top school to impress anyone? He had other priorities. Mohammad first read about Mohammad Khatami when he was the Minister of Culture and Islamic Guidance. While there, Khatami had drawn the ire of Islamists by championing Iran’s new filmmakers then coming into prominence. Two former architect students were behind Iran’s new cinema wave, Mohammad explains as we sit to tea one evening. The pair enjoyed a close relationship with Mir Hossein Mousavi, prime minister of Iran during the 1980’s, and a close confidante to Ayatollah Khomeini. Khatami was one of Moosavi’s ministers. Through Khatami’s support, these two filmmakers were given some space to develop Iranian cinema in their own vision, said Mohammad. This appalled the conservatives. “The Hezbollahis didn’t like the bleak, abstract outlook of these art films,” Mohammad said. And at one point he read that Khatami had quit his post. Mohammad never heard of Khatami again until his name was floated as a presidential candidate in the Iranian presidential elections of 1997. Much of life in Iran takes place behind closed doors and locked gates. Walls wind through much of the capital and the provinces, guarding the rhythms of private life, cloaking rose gardens and the many things that may be labeled a deviance by the Islamic Republic. In the months leading to the 1997 presidential election, Mohammad recalls walking out of the family compound to a blitz of posters of frontrunner Ali Akbar Nategh-Noori, speaker of the Majlis, which were plastered outside all the walls. But to Iran’s suppressed youth, teeming with testosterone, armed with satellite TV and the internet, there was no competition between the two candidates. To Iran’s persecuted second-class citizens—women—the tremendous support of the conservatives for Nateq-Noori was the strongest reason to vote for any other candidate. Ali’s recollections of the 1997 presidential campaign are very similar. “Two months before Khatami was elected, everyone thought Nateq-Noori was going to win, everyone from the BBC and the national press on down,” Ali said. “Noori went to many different cities and towns. He was so well known and so famous that Khatami was just viewed as this mohreh”—a dispensable piece in a chess game. One day a stack of these posters found their way to Ali and his friends. They took them back to their neighborhood. “Everyday I would hang a poster of Khatami on our front gate. The next morning it would have a tear in it. I’d put up a new poster, and I’d find it torn again the next day,” he said. Separately, Mohammad adds, “It was a lot like the Howard Dean campaign—anti-establishment, grass-roots, and with no real party backing. It was the hip thing to support Khatami and that’s why a lot of people got involved in politics. Lots of young people had posters of Khatami on their car windows and drove around picking up girls. According to Mohammad, the government conducts polls in secret, and based on those predictors during the 1997 campaign, the conservative camp sensed doom. “There were a few polls out toward the end of the campaign—we didn’t know it then, we found out later—that showed Nategh-Noori losing. There are polls in Iran, but they’re confidential. Sometimes certain newspapers with close government sources will reveal something. But polls are generally taken in secret. Mohammad continues, “Voting was a few days after Ashoora”—a solemn religious holiday where Shiites commemorate the martyrdom of Hussein. “So the right-wing, the Hezbollahis, gathered a bunch of soo-sool boys”—metrosexual types—“supplied them with posters of Khatami to wave, then had them go out to play music and make a lot of noise on Ashoora. They had the girls with them act immodestly. It was supposed to turn off a lot of the religious types that were leaning toward Khatami. Ali was just as incredulous. During this time, newspaper kiosks pulsed with new life. Ali went to the newsstands every afternoon and picked papers like wildflowers from a field. He piled a stack of them into his arms and hurried home to bask in every line. “One week before the election, there was a certain energy in the city,” he said. “At moments it felt like this may really happen. Even so, until the last moment it wasn’t 100 percent that Khatami would win. Nobody believed it. “Two days before the election, Resalat newspaper carried on its front page a political forecast that the conservatives would win in every town and city—except Yazd, which is Khatami’s hometown. “Those who were conducting polls knew Khatami would be elected. Salaam newspaper, which supported Khatami, published a big photograph of Khatami the day before the election with a banner headline that read Salaam bar Khatami”—Hello, or Peace be upon Khatami. On the morning of the election, Mohammad and a friend went to the polls near his house. “There were a lot of religious people there, a lot of young people, of course, and surprisingly a lot of chic women, too. All had turned out to vote for Khatami—all of them. This was such a great opportunity to say, ‘Mr. Khamanei, we desperately need a change.’ The vote was a message to Khamanei more than anything else. Mohammad pauses for a moment. When at the end of the campaign the mille-fueille of posters came down, they were in themselves as thick as a wall, he says, demonstrating the width of the paper wall with a stretch of his thumb and forefinger. You are currently browsing the archives for the Mousavi category.